M. L. Rio has worked in bookstores and theatres for years, and is currently pursuing her MA in Shakespeare Studies at King’s College London. 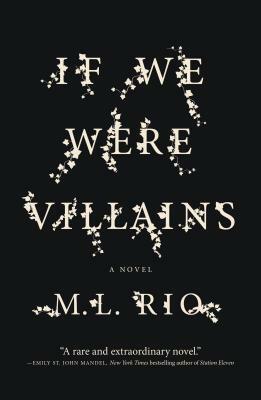 If We Were Villains is her debut novel. "Pulls the reader in from the first page...A well-written and gripping ode to the stage...A fascinating, unorthodox take on rivalry, friendship, and truth, IF WE WERE VILLAINS will draw readers in and leave them pondering the weight of our biggest actions and their consequences." "This is a rare and extraordinary novel: a vivid rendering of the closed world of a conservatory education, a tender and harrowing exploration of friendship, and a genuinely breathtaking literary thriller. I can’t recommend this book highly enough, and can’t wait to read what M. L. Rio writes next."